Associate Professor of History Jill Bender has been appointed a Fellow at the National Humanities Center for the academic year 2019-2020 for her research project "Assisted Emigrants: Irish Female Migration Projects and the British Empire." For more information, see the NHC website. 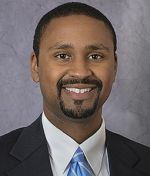 The UNCG Department of History is pleased to announce that Dr. Torren Gatson has been hired as Assistant Professor in Public History at the start of the fall term. Gatson's research focuses on historic preservation, material culture, 18th-20th century United States history, African American history, and southern history. 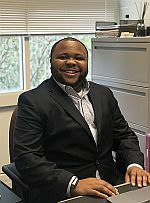 Dr. Gatson defended his dissertation "The Combative Tactics of the NAACP Against Unfair Housing Laws and Practices: A Comparative Study of the Dynamic Changes in Urban and Rural Landscapes 1920-1960" in March 2018 at Middle Tennessee State University. Currently, he is a Visiting Assistant Professor in the department. 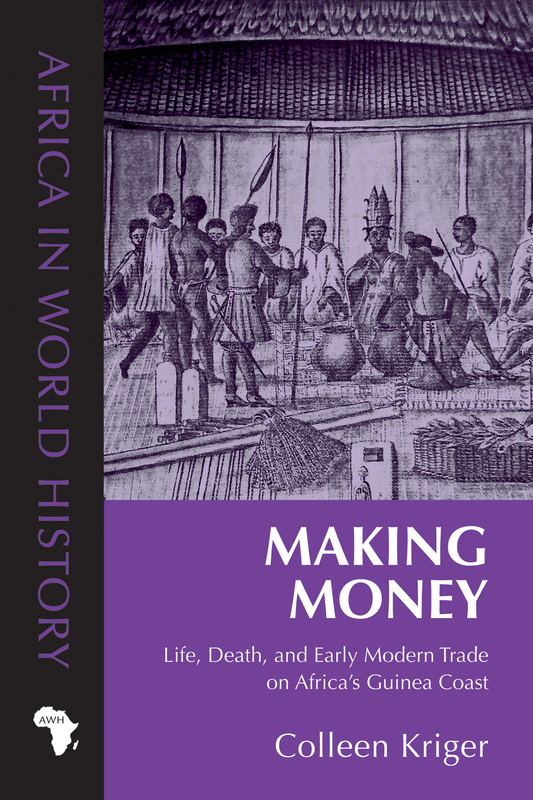 "Reading Against the Grain: Perspectives on Atlantic Slave Trade"
Thursday, April 11th, 5:30-6:30 p.m.
Dr. Colleen Kriger will discuss her new book Making Money: Life, Death, and Early Modern Trade on Africa's Guinea Coast (2017, Ohio University Press). How did free people become captive cargoes on Africa's west coast during the Atlantic slave trade? Historian Colleen Kriger's recent book, focuses on the human complexity of this trade in commodities and captive people and how it was organized. The surprisingly detailed business records of England's Royal African Company raise interesting questions about writing "African" history from "European" sources. Refreshments will be provided. 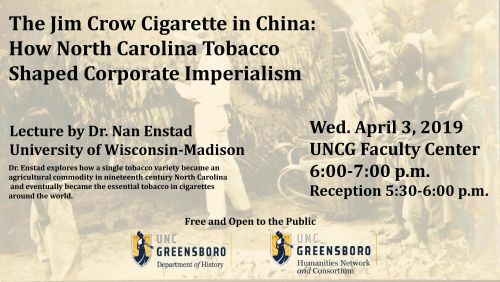 "The Jim Crow Cigarette in China: How North Carolina Tobacco Shaped Corporate Imperialism"
This talk explores how a single tobacco variety, bright leaf tobacco, became an agricultural commodity in nineteenth century North Carolina and Virginia and eventually became the essential tobacco in cigarettes around the world. Bright leaf developed during the years of Reconstruction and the rise of Jim Crow segregation. When bright leaf went global, it took Jim Crow with it - especially to China, the largest outpost of the British American Tobacco Company. Hundreds of white men from North Carolina went to China to build the bright leaf industry with Chinese businessmen. The Jim Crow cigarette boomed in popularity in both the US and China in the 1920s. Dr. Enstad is the Robinson Edwards Professor of History at the University of Wisconsin, Madison, an affiliate of the Gender and Women's Studies Department, the Afro-American Studies Department, and the current Director of the UW Food Studies Network. She is the author of Cigarettes Inc.: An Intimate History of Corporate Imperialism (University of Chicago Press, 2018) and Ladies of Labor, Girls of Adventure: Popular Culture and Labor Politics at the Turn of the Twentieth Century (Columbia University Press, 1999). She has a PhD in history from the University of Minnesota . From 1993-2001 she was faculty at the Department of History at UNCG. "Resistance: How Did It Change the Vietnam War?" Thursday, April 4, 7:00-9:00 p.m. The soldier revolt, draft and war tax resistance, moratorium marches in Washington - how did mounting G.I. and popular opposition to the war in Vietnam affect military strategy, presidential and congressional debate and decision-making? And how did anti-Vietnam resistance spur lives of activism in the antinuclear and peace movements? David Cortright was an active duty G.I. activist who defended his first amendment right to oppose the war in federal court in 1971. He later became a leader in the 1980s nuclear freeze movement. Director of Notre Dame's Kroc Institute for International Peace Studies. Cortright is the author of Soldiers in Revolt: G.I. Resistance during the Vietnam War (2005) and Peace: A History of Movements and Ideas (2008). Bill Ramsey was a North Carolina student anti-war organizer and coordinator of local anti-Vietnam war tax initiatives. He was later active in nuclear disarmament campaigns and movements to oppose U.S. military interventions. He worked for the American Friends Service Committee and founded the Human Rights Action Service. 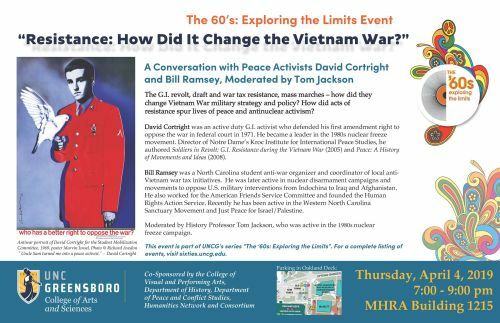 Moderated by History Professor Tom Jackson, who was active in the nuclear freeze campaign and anti-apartheid movement of the 1980s before becoming a historian of civil and human rights. "Excavating a Museum: The 1930s Princeton University Antioch Project"
During times of conflict, archaeologists can turn to older materials in museums when fieldwork is unsafe to carry out for any reason. In the 1930s, Princeton University conducted large excavations in the city of Antioch, once the 3rd largest city in the Roman world and presumed in decline, now in modern Turkey on the Syrian border. However, the excavations were only partially published and included the most beautiful museum-worthy pieces with no stratigraphic information. As such, our project investigates whether one can piece together a ninety-year-old dig through the available archive of records and material culture. In this talk, I will discuss the process of excavating a museum archive - analyzing 300 boxes of material culture heretofore untouched sitting in the storerooms of Princeton University's Art Museum. These along with a repository of saved records in the Department of Art and Archaeology's Visual Resources Department have allowed us to understand one sector of the city - a case study and pilot project - in surprising and dynamic ways. The sector of 17-O, in the heart of the city, shows us how a city transformed, adapted, and thrived over time in the face of political change, conquest, and natural disaster. This has greater implications on the ways in which we understand the afterlives of post-Roman cities, long thought to be sunken in decline or abandoned. This talk is co-sponsored by the Archaeology Program and Archaeology Club. Wednesday, January 23, 3:30 p.m.
Ayla Amon is a Curatorial Assistant at the Smithsonian National Museum of African American History and Culture where she works on the Slavery and Freedom exhibition. Ms. Amon will be discussing interpretation in museums and the changing role of the community in developing exhibitions. Sponsored by the National Museuam of African American History and Culture, UNCG Lloyd International Honors College and UNCG Department of History. Saturday, November 17, 2018, 3-5 p.m. In 1963, a wave of protestors fought segregation in Greensboro. Many of them were arrested and detained at the Greensboro Polio Hospital. This lecture is part of an exhibit and series of programs to commemorate the complicated history of the polio hospital. Please come and share your story. Refreshments will be provided. Please RSVP to this free event at go.uncg.edu/poliohospital. For disability accommodations, please contact: uncgmuseumstudies@gmail.com or 336-334-5645. Sponsored by UNCG Department of History, International Civil Rights Center & Museum, North Carolina Humanties Council, and the Greensboro History Museum. Friday, November 16, 2018, 6:30 p.m. Screening # 1: "The Band," led by Associate Professor of History, Richard Barton. It's Alive & This is Now. The series premiere explores how the band was created and commits itself to constant change. The second episode illuminates how the Grateful Dead scored success on their own terms, yet sabotaged their chances at superstardom. Sponsored by UNCG Department of Religious Studies, UNCG College of Visual and Performing Arts, and UNCG Greensboro Project Space. Associate Professor Lisa Levenstein contributed to a podcast in September 2018 by the Journal of American History (JAH) about the Beijing Women's Conference of 1995. The podcast can be accessed at http://jah.oah.org/podcast/. Dr. Levenstein's contribution is based on her recent article in the JAH: "A Social Movement for a Global Age: US Feminists and the Beijing Women's Conference of 1995," Journal of American History 105:2 (September 2018): 336-65. Parsons Publishes "From Asylum to Prison"
Dr. Anne Parsons' research on the history of mass incarceration of individuals with mental illnesses has culminated in a new book: "From Asylum to Prison: Deinstitutionalization and the Rise of Mass Incarceration after 1945." Published in early October by UNC Press, "From Asylum to Prison" charts how the politics of mass incarceration shaped the deinstitutionalization of psychiatric hospitals and mental health policy making. Read more in Campus Weekly. Dr. Christopher Hodgkins, Director of the Atlantic World Research Network, announced that M.A. history/museum studies student Chelsea Stewart won a 2018-19 AWRN Graduate Student Research Grant. Stewart will use her grant to support her travel to Newport, Rhode Island for the pursuit of research on the Vernon shipping family in area archives and sites. Her project promises to bring new insight into the role of northern shipping interests in the transatlantic slave trade. RESCHEDULED: Sunday, November 4, 2-4 p.m.
Help remember the Central Carolina Convalescent Hospital. After just three months of fundraising and construction, the hospital opened on October 11, 1948, in response to the North Carolina polio epidemic. Join us at the hospital site to commemorate the hospital's opening with speakers and stories from the community and an exhibit about the site's history presented by students in UNCG's M.A. in History/Museum Studies program. Refreshments provided. Please RSVP to the event at: go.uncg.edu/poliohospital. Sponsored by UNCG Department of History, the Greensboro History Museum, and People & Paws 4 Hope. For disability accommodations, please email UNCGMuseumStudies@gmail.com or call 336-334-5645. "The Agony of Mosul Under ISIS"
Tuesday, Oct. 30, 3:30-5 p.m.
Noor Ghazi will be presenting her original research on the situation in Mosul and her recent visit there. Following her talk there will be an open discussion with Dr. Jerry Pubantz from Political Science Department of University of North Carolina at Greensboro and Dr. Jeremy Rinker from UNCG Peace & Conflict Studies and Dr. Asa Eger from UNCG Department of History. This event is sponsored by Living Learning Communities, Islamic Studies Research Network and the UNCG Humanities Network and Consortium, UNCG Office of Intercultural Engagement, The Department Religious Studies - UNCG, UNCG Peace & Conflict Studies, and Lloyd International Honors College at UNCG. 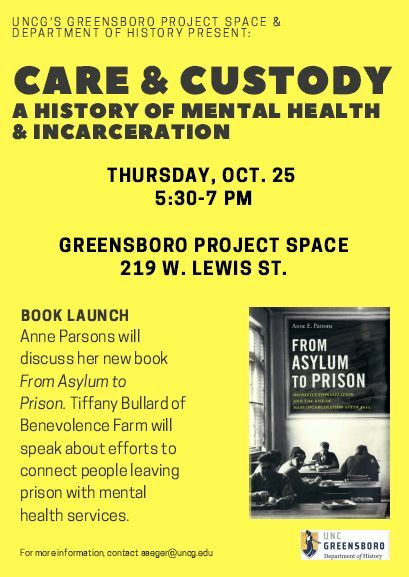 "Care & Custody: A History of Mental Health and Incarceration"
Thursday, Oct. 25, 5:30-7 p.m.
Dr. Anne Parsons will discuss her new book From Asylum to Prison: Deinstitutionalization and the Rise of Mass Incarceration after 1945. To many, asylums are a relic of a bygone era. State governments took steps between 1950 and 1990 to minimize the involuntary confinement of people in psychiatric hospitals, and many mental health facilities closed down. Yet, as Anne Parsons reveals, the asylum did not die during deinstitutionalization. Instead, it returned in the prison industrial complex as the government shifted to a more punitive, institutional approach to social deviance. Parsons shows how the lack of community-based services, fear-based politics around mental illness, and the economics of institutions meant that closing mental hospitals fed a cycle of incarceration that became an epidemic. Sponsored by Greensboro Project Space and the UNCG Department of History. Refreshments will be provided. "Living with Little Corpses in Late-Roman and Early Medieval Britain"
Wednesday, Oct. 24, 6-8 p.m. Invited Scholar Lecture. Stillborn and infant burials are a standard feature of Roman-period settlements and urban cemeteries in Britain. This, however, is not true for early medieval sites, where infants rarely make an appearance. But because of the great chasm dividing Romanists from medievalists, the changing fate of little corpses has gone unnoticed. This talk will explore the ways a handful of not very fancy communities during the late-Roman and early medieval periods dealt with their dead babies. Little corpses can help us pinpoint some of the profound transformations in the lived experience and thought worlds of people in Britain first under and then after Rome that are completely unwitnessed by texts. They are useful in helping us track the ways a variety of ordinary Britons experienced the withdrawal of the Roman state from Britain. Sponsored by the UNCG Department of History, UNCG Archaeology Program, and UNCG Humanities Network and Consortium. Thursday, Oct. 18, 2018, 6:30 p.m.
Thursday, Oct. 4, 2018, 6:30 p.m.
Thursday, Sept. 13, 2018, 6:30 p.m. The UNCG Department of History is pleased to announce the hire of a new assistant professor of early American history and to welcome back one of our own to Greensboro! Dr. Warren Milteer earned his Ph.D. degree in history from UNC-Chapel Hill in 2014 and his M.A. degree in History from UNCG in 2009. He will join our faculty this fall after holding assistant professor positions at Virginia Tech and the University of South Carolina. Milteer's research focuses on the history of free people of color (people of African American and American Indian descent) in North Carolina from the colonial era through the Reconstruction era of the late nineteenth century. Two of his journal articles have won the R. D. W. Connor Award for the best article in the North Carolina Historical Review in 2014 and 2016. Dr. Milteer will teach a variety of early America history courses, the History of North Carolina, the role of Race in American history, the history of interactions between African and Native American peoples, and graduate reading seminars. He tells us that "I am excited to work with a diverse body of students who bring a variety of life experiences and ideas to the classroom. I plan to show them how to use historical knowledge as a tool to connect the past, present, and future." Dr. Milteer is also excited about returning to his native state: "I am delighted to be returning to North Carolina and look forward to reconnecting with old friends and developing new relationships." Please join us in welcoming Dr. Milteer back home! MHRA 1215, 2211, 3204, 3208, and 3501, 9:00 a.m. to 1 p.m. The History Graduate Student Conference will be held on Thursday April 26, 9:00 am-1:00 pm (Reading Day) in MHRA. This year's conference features paper presentations by graduating MA students and Senior Honors students, along with poster presentations by Museum Studies students, MA students who participated in the Graduate Research Expo, and Library Science students and faculty who worked on the Runaway Slave digital database. Download the conference program in PDF format. "After completing a Bachelor's degree in history from Carleton College in Minnesota, I looked for graduate programs that offered a good combination of theoretical coursework and field experience..."
The UNCG Department of History creates and disseminates knowledge of history through research, teaching, and public and professional service. Faculty members collaborate with peers around the world; open new lines of historical inquiry; and communicate their discoveries via university courses, publications, scholarly presentations, public projects, and community events. Undergraduates explore the historical development of human societies from a variety of perspectives, thereby acquiring a wide range of practical skills, such as the abilities to gather and analyze primary sources, interpret complex phenomena, and communicate effectively in both writing and speaking. Graduate students train in the methods of historical scholarship and gain broad pre-professional experience in research, pedagogy, and public history. As members of a public institution with a commitment to community engagement, we strive to serve Greensboro, the state of North Carolina, the nation, and the world by cultivating and nurturing wisdom, tolerance, and reason through a deeper understanding of the human experience.